Could Center City Homes be Driving Millennials Out? | Econsult Solutions, Inc. If you enjoy reading about the real estate market, there is one topic that is unavoidable—millennials. Every month there seems to be a new question about this generation and how they’re affecting one part of the economy or another. Will they ever buy houses, move to the suburbs or have kids? In recent times, Philadelphia has been repeatedly identified as a hot spot for millennials; and a 2016 DVRPC study notes that nearly 30 percent of the City’s population falls within this age cohort. So for this month’s look at the Philadelphia Housing Index, we were curious about the relationship between Philadelphia neighborhoods’ changing millennial composition and how it affects the PHI Neighborhood Index. Could we find a link between an influx in the 20-35 year olds living in a neighborhood and home prices? Let’s take a look. We examined neighborhoods that have had the greatest change in millennials as a proportion of their total population between 2010 and 2015. We identified millennials specifically as the 20-35 year-old age cohort, using the age table for each census tract in Philadelphia from the 2010 Decennial Census and 2015 5-year ACS Survey. We then performed a spatial join to attach that data to our ESI Neighborhood boundaries. Keep in mind that we don’t look at other characteristics like race, average income or education—factors that are often taken into account when talking about urban millennials. 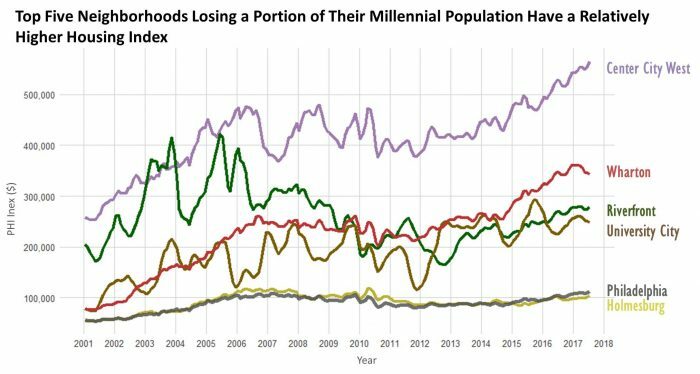 You’ll notice that we decided to look at the change in the millennial population proportion as opposed to the absolute change or simply the 2015 proportion of millennials in a neighborhood. This is because we wanted to look at how neighborhoods age demographics have changed in recent years. For example, you may expect that a majority of the population in University City is between the ages of 20 and 35 years old. What’s interesting is that between 2010 and 2015, that portion decreased by 5.4 percent, making the neighborhood slightly less millennial-centric than it was previously. We’ll get into what that means and how that relates to the PHI below. A word of warning about neighborhood names. As my colleague Andrea Mannino mentioned in a previous post, we use the boundaries created by the University of Pennsylvania’s Cartographic Modeling Lab for the PHI. So, while the new millennial hotspot might be SoNo, Port Fishington or Spring Arts, for methodological purposes, we’ll be sticking with our existing neighborhood designations. The interactive map below shows where millennial growth has happened between 2010 and 2015. By looking at the proportional change, you can see how a neighborhood’s composition has changed. Unsurprisingly, Point Breeze and Kensington have seen disproportionately large growth in its millennial population. Notice also that some of Philadelphia’s most millennial-concentrated neighborhoods (Center City West, University City) have also been the neighborhoods to see a slight decrease in the proportion of millennial residents over time. Keep in mind that we aren’t taking into account developer activity or other characteristics of gentrification (sounds like a topic for a future blog post), but simply evaluating the relationship between the PHI and how neighborhoods’ millennial composition has changed in recent years. 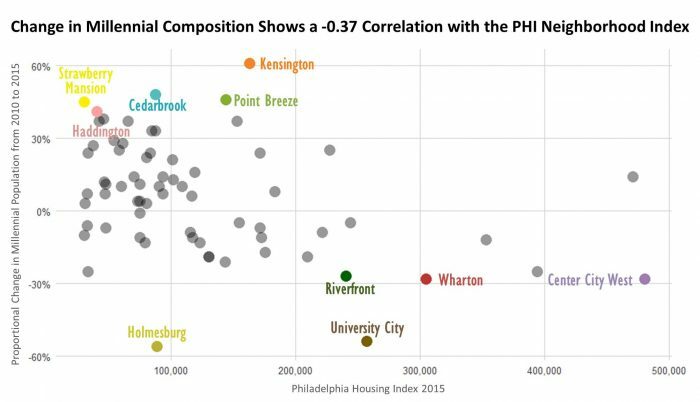 After examining the relationship between the change in neighborhoods’ millennial compositions and various dimensions of the Philadelphia Housing Index, we only found a correlation with the PHI Neighborhood Index (-0.36) to be significant. That means that neighborhoods with a shrinking proportion of millennial residents (compared to the total population within its boundaries) are likely to have higher neighborhood premium. The likely reason for this is probably related to millennial purchasing power. Housing prices in neighborhoods like Center City West, University City, and even Fishtown are not as attainable as adjacent neighborhoods like Kensington or Point Breeze. What does the PHI say about these neighborhoods? Looking first at neighborhoods that have seen the greatest decrease in millennial residents as a proportion of the overall population, you’ll notice that Center City West, University City, and Wharton (which includes Bella Vista and Hawthorne) have all experienced a proportional decrease in their millennial population, while gaining in overall residents. These neighborhoods, as well as Riverfront (which has too small of a population to draw definitive conclusions on population change or sale price), all posted housing index premiums well above the City average. The outlier in this group is Holmesburg. The 2015 American Community Survey indicates that the neighborhood’s millennial population has declined by nearly 3,000 residents between 2010-2015. The outflow of millennials in that neighborhood is not related to home prices as much as locational preferences and neighborhood change not accounted for in this study. As for the neighborhoods that have experienced the greatest gains in millennial residents? The story is less clear. Kensington and Point Breeze are right on the edge of higher priced neighborhoods like Fishtown and Center City. So while they are well above the Philadelphia average, these neighborhoods are often more affordable, especially for first-time millennial home buyers. Haddington, Cedarbrook and Strawberry Mansion are less traditionally known as millennial “hotspots,” but it would be unwise to ignore these neighborhoods. 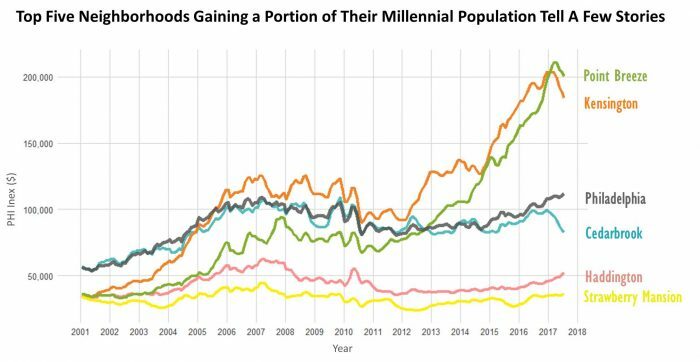 While they still have less than the city’s average millennial resident population (currently estimated at 26 percent), this cohort’s outsized population growth between 2010-2015 is telling of the citywide trend of millennials seeking affordable housing options. What do you think of our preliminary results? Should we take a deeper dive into how changing age cohorts relate to the PHI? Email lavery@econsultsolutions.com and let us know! Gina Lavery is an Associate Director at Econsult Solutions. 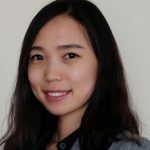 Gina focuses and leads projects on market research and analysis for the Greater Philadelphia area.